Do you need a control panel to complete your automation project or system upgrade? Our in house panel shop is ready to provide the results you need to make your project successful. 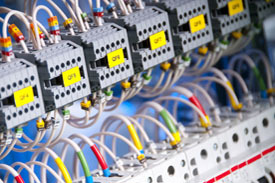 We can design the electrical control system, modify existing systems and manufacture a control system that will integrate seamlessly with your equipment. Send us your requirements and let's get your project moving. Our services include the following: Electrical Design, Documentation (Drawings), Manage Hardware Orders, Build Panels, Test Panels, Integrate.